Dragonslayer guarding Anor Londo cathedral. and sends human foes flying. Unlike other weapons that scale with Faith, the Dragonslayer Spear gains Lightning damage - not Magic damage - from the Faith stat. It's also the only weapon in the game with scaling Lightning damage. An easy way to obtain the Dragonslayer Spear is to downgrade the Lightning Spear dropped by the Mimic in Sen's Fortress to a +10 Spear, and then upgrading it to the Dragonslayer Spear. However, a +5 Dragonslayer Spear will not significantly outperform a +5 Lightning Spear at lower Faith levels (~16 or below) until the user well exceeds the required levels in Strength or Dexterity. A fully-upgraded Demon's Spear also has a higher overall damage rating at low Faith levels, and deals more Lightning damage at Faith levels of 42 and below. One-handed strong attack is a long range lightning bolt that scales with the weapon's Faith scaling. 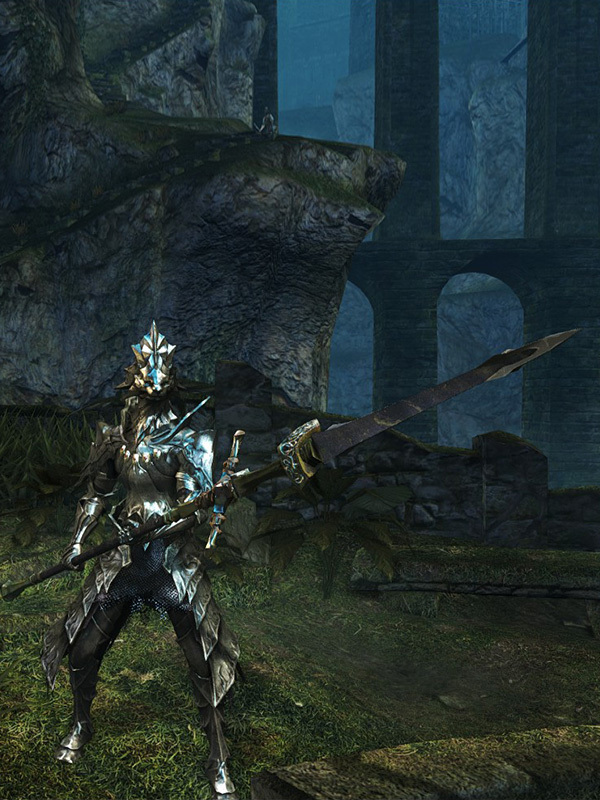 (range is nearly twice as long compared to that of the Moonlight Greatsword's one-handed moonlight wave). Consumes 20 durability per use, and damage is identical to a Lightning Spear as if the Dragonslayer Spear was treated as a catalyst. Two-handed strong attack is a slow strike forward. Pressing R2 a second time will result in a close-range, delayed upward thrust that can knock opponent airborne. The second attack consumes 20 durability. 60% STR, 100% DEX, 100% FAI scaling. 1. This means the Spear weapon class, although the Spear can be used too. 2. when two handing this weapon, only 16 Strength is required.